Commercially bred dogs and cats often exist in poor conditions, and many unadopted shelter animals are put to death each year. But a new ordinance may help to improve circumstances for companion animals on both sides of the equation. San Francisco has reportedly joined the ranks of cities that have passed bans on the commercial sale of dogs and cats. On February 14, San Francisco’s Board of Supervisors passed an ordinance prohibiting retail stores from selling commercially bred dogs and cats. Stores are instead encouraged to partner with animal shelters and rescue groups to display adoptable animals. But the new law, which also prohibits the sale of puppies and kittens under eight weeks old, doesn’t make it illegal to breed companion animals. The unanimously-passed ordinance was introduced by District 4 Supervisor Katy Tang. In an editorial in the San Francisco Examiner, Tang wrote that the law is intended to reduce the number of dogs and cats who are killed in shelter facilities each year by decreasing the commercial demand for animals bred in puppy and kitten mills. Currently, there are no retail stores selling commercially bred dogs and cats in San Francisco. Tang lauded the city for its humane business practices while noting that the ordinance would help to uphold the city's commitment to animal welfare. 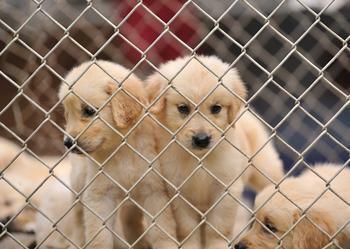 "This ordinance will serve as a deterrent, preventing a business from moving into San Francisco and selling animals from irresponsible mass-producing breeders that churn out puppies and kittens as if they were on an assembly line," Tang wrote. In 2006, Albuquerque became the first city to pass a ban on the retail sale of commercially bred dogs and cats. Since then, other cities -- including Chicago, Philadelphia, Boston, San Diego, Los Angeles, Austin, and Las Vegas -- have passed similar legislations.